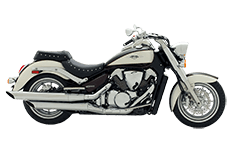 Suzuki's Boulevard series motorcycle is a sleek machine that carries its weight in gold on any road it travels. Riders know that only the best in luggage compartments will do, therefore we don't waste our time with cheap bags. Here in our online store, you'll find a wide selection of saddlebags made specifically for the Boulevard C109. Featuring the Viking Bags lineup of luggage, riders can find everything they want and more in an affordable saddlebag. Check out our online collection of Suzuki saddlebags to find the perfect one for your Boulevard C109. We're confident you'll find exactly what you need here in our online store, and we're even offering a 30-day money back guarantee. Every purchase comes with its own set of mounting hardware and installation instructions to avoid confusion when riders want to mount. We'll even help you out if you need a suggestion or two!